People often ask me why I choose to do such a broad variety of things in my professional life, and I find that I have no clear answer other than, I have a large variety of interests, and I choose to explore all of those interests instead of choosing one over the others. This may seem crazy, or confusing, but for me, it’s what keeps me motivated. Before I explain, let me first break down what exactly it is that I do in my business. Cara B. Design Studio is a subsidiary of Cara B. Design & Wellness. Cara B. Design Studio focuses on art, while Cara B. Design & Wellness focuses on wellness services and products. I started Cara B. Design & Wellness in 2008 as Cara B. Health & Beauty. Initially, my business was focused on bridal makeup, and occasionally out-call massage therapy. Over time, my business evolved, as did my business name and in 2012, I re-branded, renaming the business Cara B. Design & Wellness. The question I’m asked most frequently, is how I got into each area that I focus on. Each one has its own unique story, and most of them revolve around injuries that temporarily sidelined me from something else. For example, I started teaching massage therapy because I herniated a disc in my lumbar (lower) spine when I was 30, and was unable to work for an extended period of time. I had great difficulty walking and maneuvering around, so my mom suggested to me that I look into teaching since I couldn’t practice for a while. I had never considered teaching, because ultimately I felt that I wouldn’t have the patience to teach. At first, I was resistant to the idea, and then it occurred to me that the only reason I had never considered teaching, was simply because I was so focused on not wanting to teach kids, I never realized that there was an opportunity to teach adults. At that point, I had already been in the massage therapy industry for 8 years and was very comfortable with my knowledge and experience. Not long after that realization, I got in touch with a fellow massage therapist who was a massage instructor, and he helped get me on the path to teaching. After I had been teaching for awhile, I started missing the hands on work, and I made the decision to go back to a massage therapy center where I had worked on and off for a number of years. I got back into the swing of things, and over time, realized that while I really enjoyed being back in practice, I also missed teaching. Around that same time, I was promoted to manager at my job and my boss was interested in getting me certified to teach continuing education courses to the staff. So, I got myself certified by the National Certification Board for Therapeutic Massage & Bodywork (NCBTMB) as a Nationally Approved Continuing Education Provider. I started by teaching the staff at my job, and then eventually started creating new courses and offering them to other massage therapists. It’s now been almost 5 years and I still love it every opportunity I get to teach. I also teach massage part time at a trade school in Delaware on an as needed basis, so I still get to maintain my private practice. Around the same time as my herniated disc (just prior to teaching), I found myself bored frequently as I wasn’t able to get around very easily. I’ve had an interest in 3 dimensional art my entire life and since I was a little girl, my mom always told me that she thought I’d enjoy sewing as much as she does. My mom is also an artist and she is also a master of the sewing machine! My closest friends bought me a gift certificate to Joann Fabrics for my 30th birthday and with the very generous gift certificate, I bought my first sewing machine (with my mom’s input of course!). 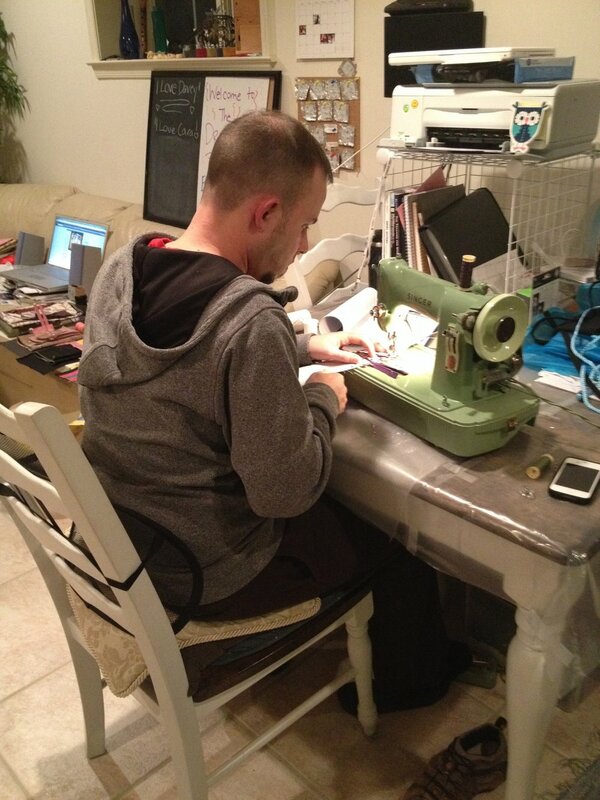 For more details on my now collection of 4 sewing machines, click here! Long story short, I started sewing as a way to pass the time, and I fell in love. I started collecting antique and vintage fabrics and designing and creating all different types of handbags and wallets. It started as a hobby and then friends and family started inquiring about purchasing my creations and in 2010 I opened an Etsy shop. Speaking of Etsy shops, in 2017, I opened a second Etsy shop after suffering another traumatic injury. This time, I dislocated my right shoulder and tore my rotator cuff. The severity of this injury required surgery, which left me in a sling, 24/7, for 6 weeks. I then developed a severe case of frozen shoulder and was unable to use my right arm for the better part of a year. Due to my boredom and inability to go anywhere since I couldn’t drive for a while and relying on only the use of my left arm (my non-dominant arm), I started getting creative in my kitchen and making bath salts and melt and pour soap with the use of essential oils and other materials I already had around my kitchen. This started out as simply a way for me to make therapeutic bath salts for soaking my injured shoulder, and developed into a business where I make everything from muscle balms, to hand lotions, to my very own essential oil creations. But, what brought me to my original careers of Massage Therapy and Esthetics? Well, those are a bit easier to explain, and neither one has anything to do with any type of injury, as I only started getting injured after my 30th birthday! Ahhh, aging. So much fun. When I was 21 I was at a crossroads in my life. I was working for a lawyer as a legal secretary and I was not enjoying my job. Prior to this role, I had worked as a medical assistant, dental assistant, bartender, restaurant server, optician-in-training, and finally, in what may have been my favorite job I’ve ever had; hostess at Chili’s. I must say, I was quite possibly the best hostess of any restaurant in the history of the world. Okay, okay, that’s a bit dramatic, but I was pretty great. I loved my job, I loved welcoming people to the restaurant, and I absolutely loved getting my hands on the microphone to announce when a table was ready on busier nights. Simple times. Anyway, back to the lawyer! The lawyer I worked for was great and I spent a lot of time thinking about my future and what I wanted to do with my life. I didn’t go away to college after high school, and clearly I had just picked up various jobs and never really fell in love with anything. I started pondering various professions, but to no avail. I then sought assistance from a self-help book for people in my shoes. By the time I finished this interactive book that helped me assess my personality, interests, and much more, I discovered a profession called massage therapy. I had never heard of a massage therapist before and I had no idea that this was a job. I looked into some schools, found the right one, registered, and then 9/11 happened. I started school 2 weeks after 9/11 and it was the perfect choice. About 6 months after graduating massage school, I was working at a day spa. I got to know some of the estheticians who worked at the day spa and I discovered that there was an entirely new profession that I was interested in, that would compliment my growing career as a massage therapist, so again, I looked into some schools, found the right one and registered. Once I graduated from esthetics school, I began my career as a wellness practitioner. So there you have it! Jill of all Trades? Maybe. Who knows what other career I may find myself enamored of in the future! You know how it goes... a random pimple appears out of nowhere, and you have a big event coming up, do you pop it, put hot compresses on it, just cover it up, or curl up into a ball and cry until it goes away? Clearly, there are many solutions to this pimple dilemma, and I would know, because I've tried ALL of them. Luckily, I discovered the Skin Script Blemish Spot Treatment and discovered that it is truly amazing and does exactly what it says it's going to do, as evidenced by my photos below of a mean 'ole pimple that came out of the blue overnight and ruined my day. I used the Blemish Spot Treatment daily starting on a Saturday, and by Wednesday not only was the pimple gone, but because I didn't squeeze it and do ridiculous things to it, it was barely noticeable! The Blemish Spot treatment is made up of 4 main ingredients that work hard to dissolve your annoying blemishes. Glycolic Acid (5%) - A deeply penetrating alpha hydroxy acid that reduces wrinkles and promotes resurfacing to refine skin texture. It provides progressive skin clearing and promotes cellular renewal that expedites the healing of breakouts. Salicylic Acid - Penetrates into the pores to dissolve impacted sebum that causes blackheads. It exfoliates the skin and reduces redness and inflammation associated with pustular breakouts. Witch Hazel - A flowering plant that is a strong antioxidant and astringent that is often used as a natural remedy for psoriasis, eczema, and other skin conditions. Spin Trap - Entraps reactive oxygen species to restore proper chemical structure and spin to destructive molecules. It also limits lipid peroxidation and free radical damage. Now, you may be wondering about some of the details mentioned regarding these main ingredients. For example, what is an alpha hydroxy acid? Or, what is sebum? What is an antioxidant and why is it good for my skin? Have no fear, Cara is here! Yeah, I know, that sounds ridiculous, but I mean it, I'm here to help you understand your skin and how to keep it healthy, strong, and as clear as possible. Let's start at the beginning. What is a pimple? According to Milady's Standard Textbook for Professional Estheticians, a pimple is an inflamed, red or blue-red lump that appears when a follicle becomes filled with oil, dead cells, and bacteria which causes it to swell and rupture, causing the debris to escape into the dermis. Because the debris is irritating and causes inflammation, white blood cells rush in to fight against the bacteria and create pus, which is a sticky, yellowish secretion. So, this pus sits just under the skin and creates an unsightly blemish that sometimes can be pretty painful! How do we tackle it and make it go away? Well, that's where the hydroxy acids come in. But before we get there, let's talk a little bit more about where pimples come from. Human skin has 2 types of glands. Sudoriferous glands, also known as sweat glands, and sebaceous glands, also known as oil glands. We're going to focus our attention for a few minutes on sebaceous glands. Sebaceous glands produce sebum which is an oily substance that lubricates the surface of the skin and helps prevent the surface from dehydration. The problem arises when sebum becomes trapped in the gland and creates a blackhead. The bigger problem arises when the blackhead becomes infected, and the trapped sebum and debris becomes more impacted, inflamed, and irritated, now you have yourself a pimple. So, what exactly is a hydroxy acid? There are 2 categories; alpha hydroxy acids and beta hydroxy acids. Alpha hydroxy acids are water soluble substances that act as chemical exfoliants, rather than manual or physical exfoliants. Beta hydroxy acids are lipid soluble substances, meaning that they are able to penetrate the skin through sebaceous glands. Ok, but let's take it a step further. We're talking specifically about 2 acids: glycolic acid, which is an alpha hydroxy acid and salicylic acid which is a beta hydroxy acid. Glycolic acid is derived from cane sugar, unripe grapes, and sugar beets, while salicylic acid is obtained from the bark of the white willow and wintergreen leaves. Glycolic acid has the smallest molecules and therefore can penetrate deeper into the pores than the other alpha hydroxy acids (lactic acid, citric acid, malic acid, tartaric acid, and mandelic acid). The combination of these 2 acids penetrates deep into the pores to fight off the bacteria underneath but also works to exfoliate the skin, helping to prevent future breakouts. Now, what is an antioxidant? An antioxidant is a substance that protects the body through blocking or counteracting the damaging effects of free radical activity. Ok, that's great, but what's a free radical? Easy! Quite simply, it's an unstable oxygen atom that tries to "steal" electrons from other atoms, causing cell damage; a process known as lipid peroxidation. Pretty simple, right? If you deal with regular breakouts, or even just the occasional pimple, I HIGHLY recommend the Blemish Spot Treatment! You don’t need much, just a tiny dab 2-3 times per day, so it takes a long time to go through a whole .5 oz. container. To purchase, click here or shoot me an email! Gerson, Joel. Milady's Standard Textbook for Professional Estheticians. Albany: Thomson Learning, 1999. D'Angelo, Janet, et al. Milady's Standard Comprehensive Training for Estheticians. Clifton Park: Thomson Delmar Learning, 2003. While it may be the very beginning of spring here in the Northeast (though it feels like the dead of winter! ), that doesn't mean that the sun is finished doing its job. See, even in the colder weather, when you're not traipsing around in shorts, tank tops, flip flops, bathing suits, etc. the sun is still working hard to make an enemy of your skin, if you don't take the steps to protect it. The sun has many tremendous benefits, but under it's bright and cheerful exterior, lurks a dark, angry, hot ball of fire that wants nothing more than to fry your skin and cause you health problems. If you're not careful, you may not only suffer the pain and irritation of sunburn, but you may suffer worse health issues, such as skin cancer. As a skin care specialist, it is my job to educate others about protecting their skin. The number one thing you can do to protect your skin, on a daily basis, is to use sun protection. There are many different types of sunblock out there, many of which contain harmful ingredients. In fact, the only active ingredients in Brush on Block are: Titanium Dioxide and Zinc Oxide (more on these ingredients ahead). Inactive Ingredients: Alumina, Boron Nitride, Chamomile Flower Extract, Green Tea Extract, Honeysuckle Flower Extract, Iron Oxides, Jojoba Oil, Mica, Rice Lipids, Rice Starch, Safflower Oil, Silica, Stearic Acid, Triethoxycaprylylsilane. 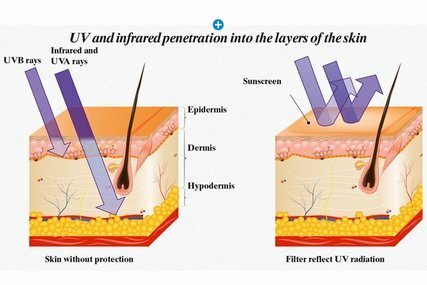 Before we go through the steps of using your Brush on Block (after the next 2 paragraphs) let's have a quick skin anatomy overview and short lesson on Ultraviolet (UV) rays and what SPF means in regards to those UV rays. Feel free to skip ahead if you already have a comfortable background in skin anatomy. The sun wreaks havoc on unprotected skin, and can cause damage such as skin cancer, premature wrinkles, sunburn, and so on. To fully understand this, I think it's important to have a quick anatomical review. So, let's talk skin. 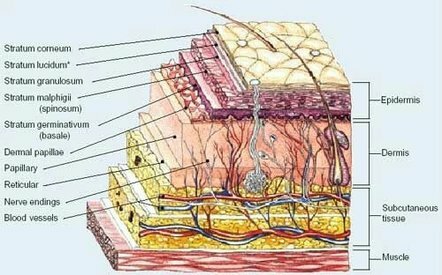 The skin has 3 main layers. The outermost layer of skin is called the epidermis, which is made up of 5 layers. Starting from the outermost layer they are, stratum corneum (superficial layer of skin made up of about 15-30 layers of epithelial cells, which are dead skin cells), stratum lucidum (thin, somewhat translucent layer that only exists in the thick skin of the palms of the hands, soles of the feet, and palm side of the fingers), stratum granulosum (3-5 layers of cells which generate large amounts of the proteins keratin and keratohyalin, which make up the bulk of the keratinocyte mass in this layer and give it a grainy appearance), stratum spinosum (composed of 8-10 layers of keratinocytes which begin the synthesis of keratin and release a water-repelling glycolipid that helps prevent water loss from the body), and finally, stratum basale (single layer of cells primarily made of basal cells, which are stem cells of the epidermis. The cells in this layer bond to the dermis via intertwining collagen fibers). The dermis, which is beneath the epidermis houses blood vessels, hair follicles, sweat glands, and other structures is made up of 2 layers: Papillary (composed of loose areolar connective tissue and fine and loosely arranged collagen fibers) and Reticular (composed of dense irregular connective tissue featuring densely packed collagen fibers). The dermis contains tough connective tissue, hair follicles, and sweat glands. The deepest layer of the skin is subcutaneous tissue, which is also called the hypodermis and is made of fat and connective tissue. Its main job is to connect the skin to the underlying fascia of muscles (see photo above) and bones. Now that you have a basic understanding of skin, let's talk a little bit about UV (Ultraviolet) rays. UVB rays, when no skin barrier exists, penetrate just through the epidermis, causing sunburn and can contribute to certain types of skin cancer. UVA rays, on the other hand, can penetrate through all layers of the skin, causing premature skin aging and like UVB rays, can contribute to certain skin cancers. It is important to note however, that even though UVA rays can reach deeper into the skin layers (because they have a longer wavelength), they are not as strong as UVB rays. Sunblock or sunscreen that has broad spectrum protection will protect against both UVB and UVA rays. The two active ingredients in Brush on Block that I mentioned earlier are Titanium Dioxide and Zinc Oxide. Titanium Dioxide is approved by the FDA (Food and Drug Administration) for use as a sunscreen, and they list it as one of the most effective active ingredients in sunscreens and sunblocks. Titanium Dioxide is derived from Titanium which is a highly reflective mineral. Due to its reflective properties, it works to reflect the UV rays. It is also nonirritating, non-allergenic, and non-comedogenic. Zinc Oxide provides protection by absorbing primarily UVA light rather than reflecting or scattering it like Titanium Dioxide does. It is non-comedoogenic, and is a mild antimicrobial. In addition to knowing your sunscreen ingredients, it's also important to know what SPF (Sun Protection Factor) your sunscreen has. Brush on Block has an SPF of 30. What does SPF actually mean? SPF measures the length of time it will take for UVB rays to burn skin while using a sunscreen as compared to how long skin takes to burn without the sunscreen. So, for example, SPF of 15 takes 15 times longer to burn skin than no SPF at all. SPF 30 protects the skin against 97 of UVB rays. All of that being said, let's to dive into the inter-workings of the Brush on Block. I've broken it down into steps for you to follow, plus pictures for those of you who, like me, need to see things in order to learn. Step 1: Hold Brush on Block in Hand. Step 2: Remove Brush on Block Cap to expose Brush Protector. Step 3: Lower Brush Protector. Step 4: Lower Brush Protector all the way. Step 5: Notice the Open/Close on the bottom portion of the Brush on Block. Step 6: Turn bottom portion of Brush on Block to the left in the direction of "Open" in order to release the product into the brush. Step 7: Tap Brush on Block on wrist to release product into brush. Once you see the powder release, you are ready to use the brush. Step 8: Notice top of brush with powder released into bristles. To left is a video of what Step 7 should look like. You should notice your Brush on Block expel powder out of the top of the brush. The first time you use your Brush on Block, you may need to tap it multiple times on your wrist to begin the flow of the powder through the shaft and into the brush bristles. Once you've "primed" your Brush on Block, you should only need to tap it against your wrist one time, to release the powder. You should always tap it at least once, each time you use it, to make sure that the powder can flow freely. How to apply Brush on Block. Quite simply really! Once you follow all of the above instructions, simply apply to your face as you would apply any powder foundation. It goes on translucent so it works on any skin tone. And be sure to smile once your finished applying! In the video above, you'll notice me twisting the top portion off of the bottom portion. This will loosen the bottom so that you can replace it with a refill. Unscrew the bottom portion of your Brush on Block to remove the refill. Top view of refill without cap on. You can see the powder inside the reservoir. Brush on Block refill available for $17. Click picture for details. Brush on Block has been the best sunblock purchase I've ever made. I ordered a sample directly from Brush on Block and tried it out and I have been obsessed with it ever since. If you're tired of greasy sunblocks, or if you're just tired of questionable ingredients in your sunblock, look no further! The best part, in my opinion, is the refill. The fact that you don't have to go a purchase a whole new Brush on Block, whenever you run out, is a huge selling point to me. It takes quite some time to run out of your Brush on Block, so don't fret! You won't be throwing money out on this. The purchase price is a great investment, and will last you much longer than you expect. Stay tuned for my next post all about quickly getting rid of blemishes! As you may or may not know, about 6 months ago, I had a traumatic fall and injured my shoulder. This injury required surgery and during my recovery, I developed adhesive capsulitis, better known as frozen shoulder. Because of this injury and the complications that have arisen, I have been unable to do my job. I haven't been able do massage work, facials, waxing, sewing, and until recently, I couldn't even type on the computer! It's been the most frustrating experience of my whole life. 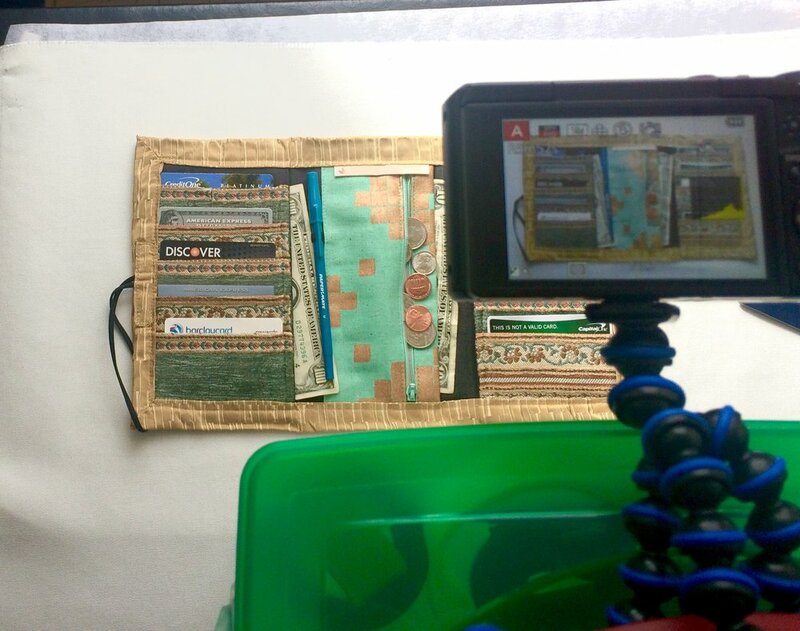 As I'm (hopefully) nearing the end of my recovery and working my way back into the world of business, I thought it might be fun to give you a sneak peek into my sewing studio and learn a little bit about my what I do, and where I do it, since I've just gotten back in there and started sewing again. So please, read on, and learn a little bit about what inspires me and how I got to where I am now with my textile art. Happy reading! 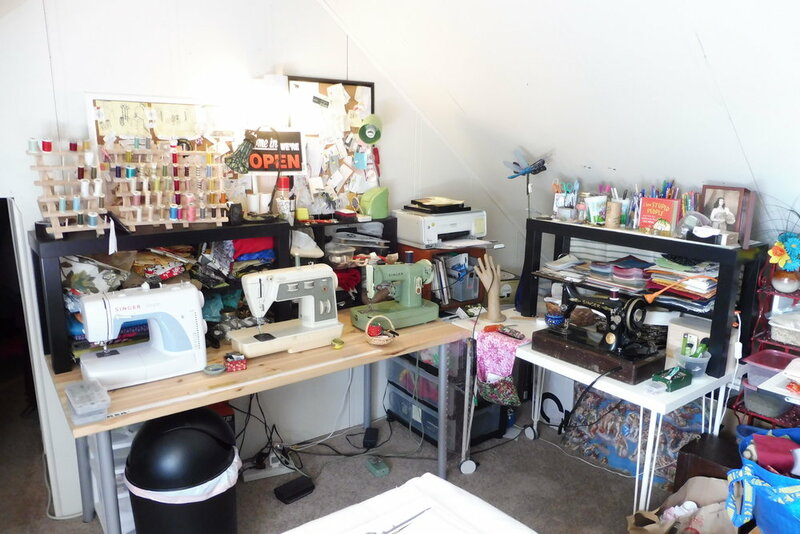 A small snapshot of my sewing studio, minus my craft shelves, drafting table, and many bins of fabric. More on those ahead! The original Cara B. sewing machine. 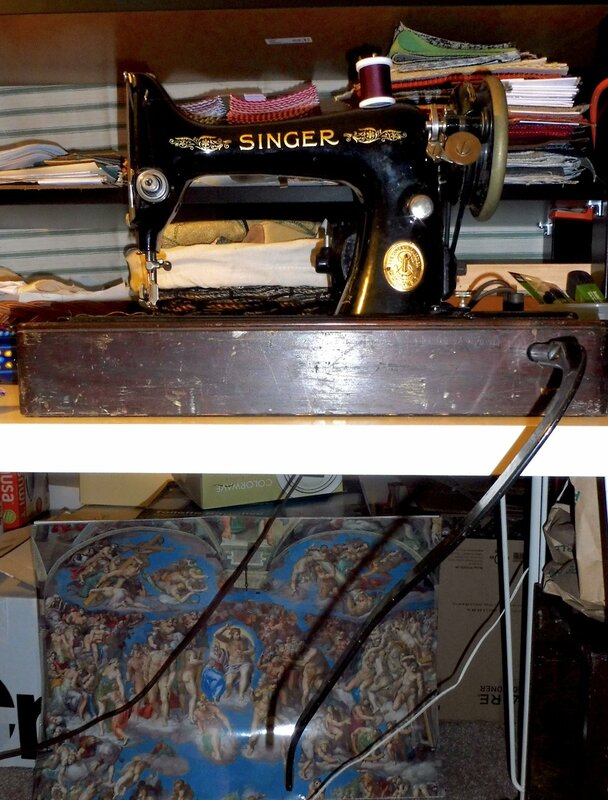 Here it is, my original sewing machine. The one I learned to sew on. 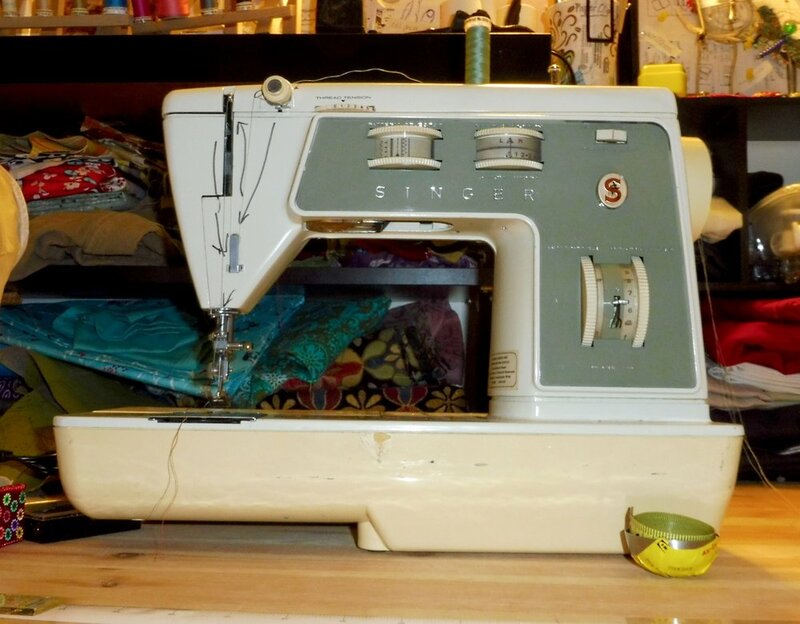 This machine was manufactured in 2010, and found it's home, with me in my sewing studio. There's an interesting story here, so bare with me. My friends wanted to do something nice for me for my 30th birthday which was in May of 2010. They all chipped in and got me a gift card to JoAnn Fabrics. I had never expressed any interest in sewing, as I had always gravitated towards clay as my primary art medium, however, my mother had been telling me my entire life that if I could just gather up some patience (of which I have very little) and take the time to learn how to sew, she knew that I would love it just as much as she has since she was a child. 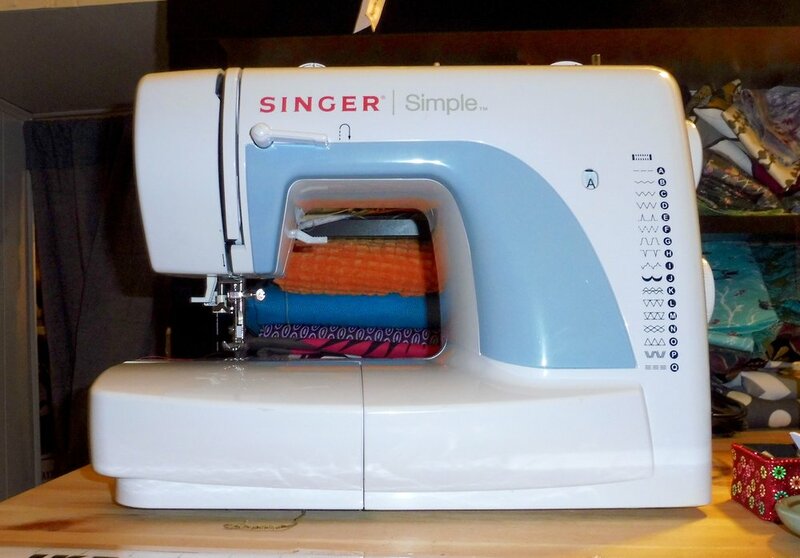 So, though it took until I was 30 years old, I finally listened to her and I bought myself a sewing machine with my gift card from my 3 sweet friends, Jaime, Jordyn, and Rachel. I taught myself how to sew by watching the DVD that came with the machine, and upon my mother's advice, I took a sewing class at the local fabric store. 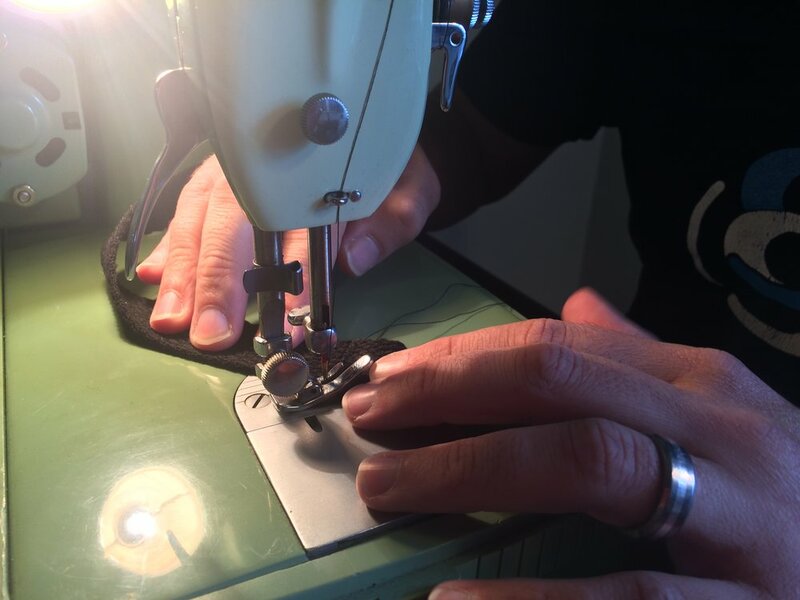 From that moment on, I became totally enamored by the machine and started sewing all the time. And so, after learning how to sew on this machine, I started getting frustrated when my stitches weren't working properly (remember how I mentioned that patience issue that I have?). I found myself yelling at the machine, occasionally smacking it and all around, acting like a fool. Dave would hear me from the other room and he'd make me take a time out until I had cooled off. Eventually, my mom suggested that we trade machines, since she's a seasoned sew-er (is that a word?). I agreed to the trade, and the machine below became my new sewing machine. What I didn't know until after we traded, was that I was putting the needle into the shank incorrectly, causing my stitches to be uneven and ragged. A few weeks ago, my mom gave me back my original machine, because she now has a much newer, better quality machine, and no longer needed mine. Her machine is still my primary machine though, because even though it was made in the 1970's, it is a BEAST! Oh, the 1970's, what a groovy time to be alive! I cannot claim that decade as mine, as I was not born until 1980. However, this super cool vintage machine was born in the 1970's sometime between 1973 and 1978. This machine here is my right hand man. It is amazing and I am obsessed with it. When my mom first traded with me, I was afraid that an older machine wouldn't be as easy to work with as a newer machine. Oh, was I wrong. So wrong! This machine was so easy to work with, and as you can see my mom used a sharpie to draw arrows around the levers for threading the upper thread properly into the machine. Without these sharpie arrows, I guarantee, without a shadow of a doubt, that I would destroy the threading of the machine and make a huge mess out of every sewing project. Thankfully, my mom thought ahead, and while I'm sure those arrows were not originally intended for me (they were probably put on the machine well before I was even born! ), I still believe she knew somewhere in the back of her mind, that someday, she'd be giving me this machine and that I would desperately need instructions because I am too stubborn to just look in the instruction manual. So, thanks Mom! I worked with this machine for quite some time, and I never really thought I'd have more than one machine. I mean, I didn't really have a need. I just had a desire in my heart to someday own a Singer treadle machine, which I am still waiting on. I love antiques, and I particularly love mechanical antiques, such as Singer sewing machines. So, when I go to an antique shop, I usually find myself looking for 1 of 3 things. An antique Singer treadle machine, an antique typewriter (already have one of those, but I like looking at others), and the most rare, an antique cash register (while I haven't found an antique cash register, the hubs and I did find a 1930's adding machine, which we adore). So, when my husband and I saw the machine below, you'll understand why it took us 4 months to purchase it. The Green Machine, made December 10, 1962 in Canada. This beautiful gem (lovingly known as the Green Machine) was discovered by Dave and me on a trip to Berlin, Maryland in 2013. Berlin is an adorable town in Maryland that was featured in the movie, "Runaway Bride" with Julia Roberts and Richard Gere in 1999. It has become a summer tradition for the hubby and me to take a trip down to the Delaware beaches every Spring for our anniversary, and Berlin has become a part of that annual excursion. Berlin is chock full of really unique (and HUGE) antique shops. On our 1st anniversary trip in May of 2013, we happened upon one of the coolest antique shops I've ever been in and saw this machine. My jaw dropped and I didn't know what to do with myself! It was priced at $125, and we agreed to not buy it because we felt it was just a bit too pricey. A few months later over Labor Day weekend, we went back to Berlin and lo and behold, there it was, on sale for $25. We were both shocked and thought that maybe we were misreading the price. So, we brought it up to the front desk to ask the owner if it was the correct price, or if our eyes were deceiving us. He also had a look of confusion about that dramatic of a price cut. But alas, it was not an incorrect price, and sure enough that machine was destined to be ours. Of course we bought it, with no questions and have never looked back. We brought it home, and Dave played with it a bit and fixed it up so that it was in working order. Now, it's his favorite of the machines and he even uses it to sew when I need assistance with a project or if I have too many orders to complete by myself (usually around the holidays). This machine is an industrial sewing machine and can cut through super thick upholstery fabrics. I really thought that this was going to be my last machine, until we found the stunner below. My favorite person working on his favorite machine. Close up with the Green machine. This is my gorgeous 1927 (more specifically, March 23, 1927) Singer Sewing Machine with knee lever rather than foot pedal. It is in 100% working condition, (thought we did need to replace the belts) even though it's a little beat up looking. Dave found this pretty girl at an antique shop in Doylestown, PA. As we were wandering around the store he came across this machine, thinking it was a tool box. How could he possibly have thought that this beautiful machine was a tool box? See photo below. Notice the Singer emblem on the front of the cover? It was facing the opposite direction, so he thought it was an old tool box. A minute later he opened the box, and the picture to the right is what he saw. All I can tell you is that I heard his voice from about 15 or so feet away from me yelling, "Honey! Honey, come here! You have to see this!" I came over and with his eyes all wide and excited, he took the cover off and we both got goosebumps. He didn't even ask if I wanted it, he just took it right to the front of the store to pay. It was $40! This is exactly how it looked when we saw it in the antique shop, except the Singer emblem was facing the other direction. We brought it home, plugged it in, and it ran like it was brand new, but it wasn't, it was born 90 years ago! It is 5 years younger than my grandmother! The biggest surprise with this machine, is that it has a knee lever rather than a foot pedal. You can see the knee lever, coming out of the front of the base of the machine on the front right side. And in case you're wondering, yes that is a poster of the inside of the Sistine Chapel at the Vatican in Rome, Italy. It currently decorates the space directly behind the sewing table above. Long story short, I purchased that poster in Italy when I was 15 years old, during a family trip to Italy. And it is now studio decoration. As we delve a little further into my sewing studio, you'll come across my drafting table, and my many many pieces of fabric. 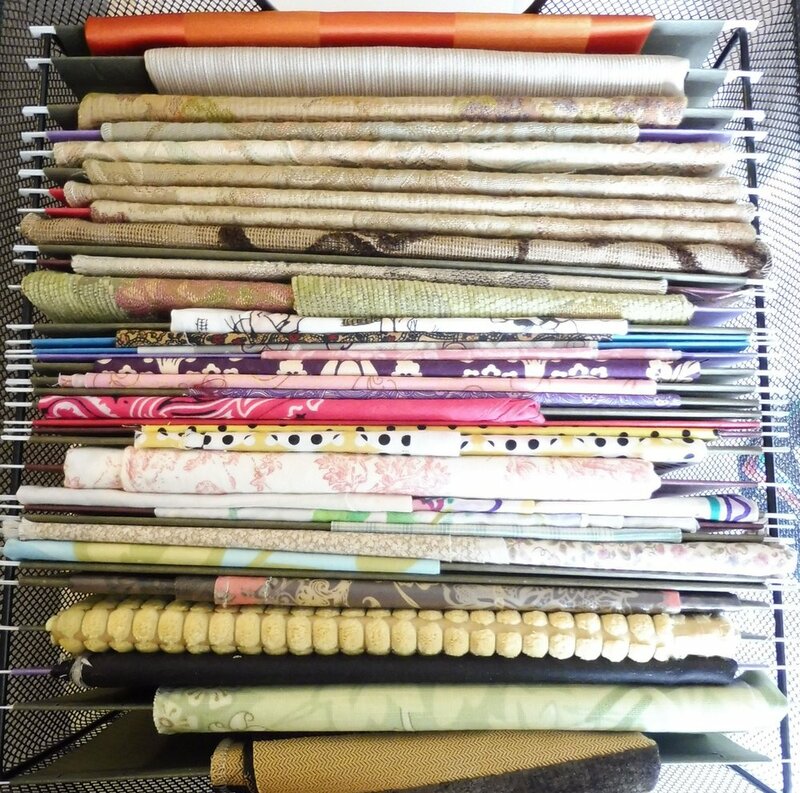 I organize my fabrics in a few different ways. 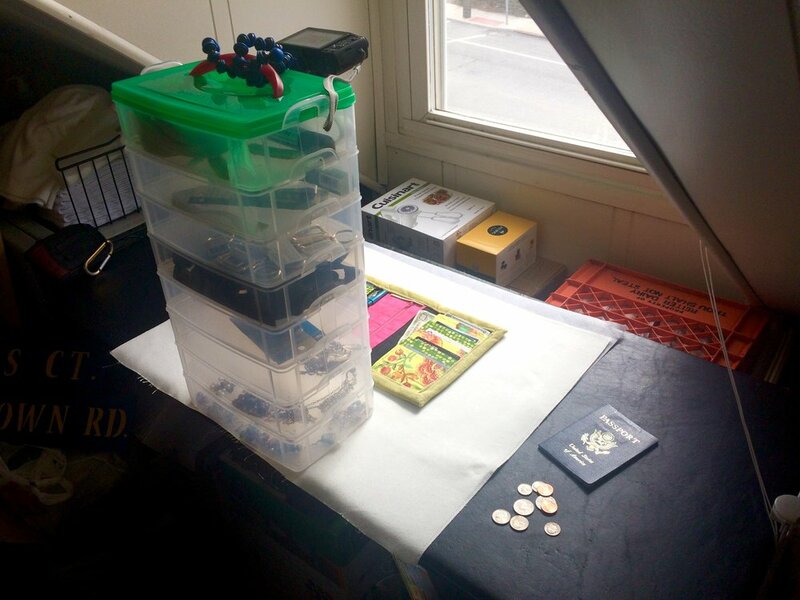 Smaller pieces (for the most part) get filed in filing bins, larger pieces get folded and stacked on shelves on one of my sewing tables, stored in large paper Trader Joe's bags, or in one of the compartments along the top of my drafting table. Drafting Table with something like 25 or 30 wallet projects just waiting to be sewn! As you can see, I have a large amount of fabric in my collection. My fabrics vary from antique and vintage to modern. I have various types of fabrics, including upholstery, throw pillow pillowcases, table runners, vintage cloth napkins and scarves, cottons, batik fabrics, curtains, and so on. 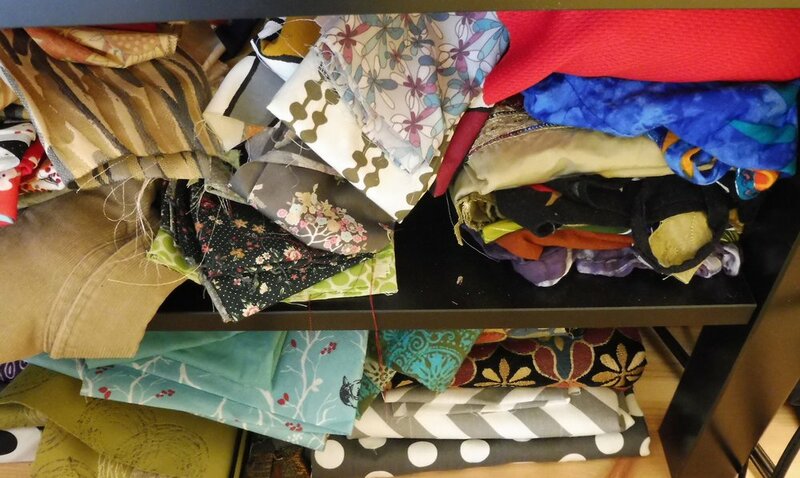 I source my fabrics from antique shops, thrift shops, IKEA (in their AS-IS section), JoAnn Fabrics, estate sales, and of course, bags and bags of fabric samples from friends who don't need them anymore. 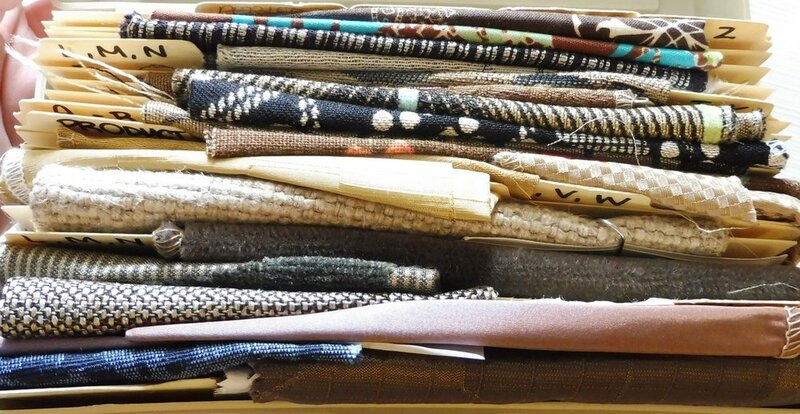 I keep collecting fabrics because somehow, I always find ways to match fabrics together for my wallets, usually unexpectedly and sometimes years after purchasing them. 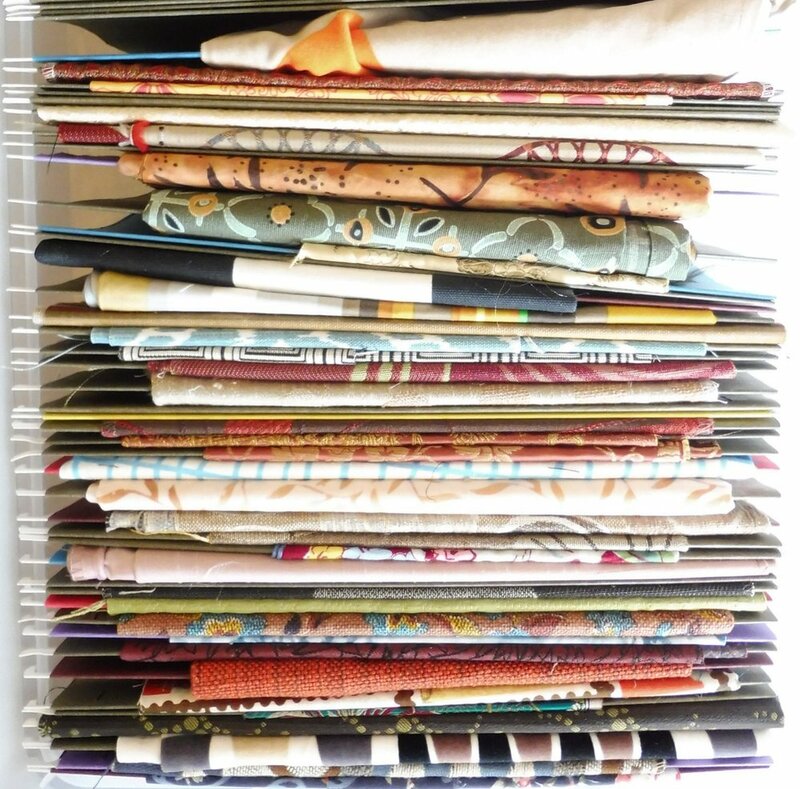 The love I have for all of these fabrics is hard to explain. In some ways, I feel like each and every piece of fabric has some sort of story, whether it's the antique fabrics or the newer fabrics, the pattern, texture, design, etc. makes each one unique, therefore when I make a wallet out of these various pieces of fabric, it tells a more complex story, and in essence, begins to have a life of its own. But how did this crazy textile obsession begin? Well, I'll tell you. In July of 2010, after dating my now husband, Dave, for a few months, we drove out to New Hope, PA which is a beautiful town along the Delaware River, across from Lambertville, NJ, which is a very similar small down. We drove to New Hope for their Friday night fireworks, which at the time were a staple in the summer months. While wandering around the town, we happened upon an antique shop and my textile obsession began. In the back of this store were bins that were chock full of antique and vintage upholstery fabric samples. On that first trip, I must have left there with about 10 or so upholstery samples. Subsequent visits would yield anywhere from 2 or 3 pieces all the way up to 30 pieces. They make up the majority of my textile collection now, 7 years after we first discovered this amazing store! Sadly, last weekend we made an impromptu visit to our favorite store only to discover that they had closed about 6 months ago. My heart was broken, and I am still in the process of trying to track down the owners and find out if they still have their fabrics or where I might be able to find them! 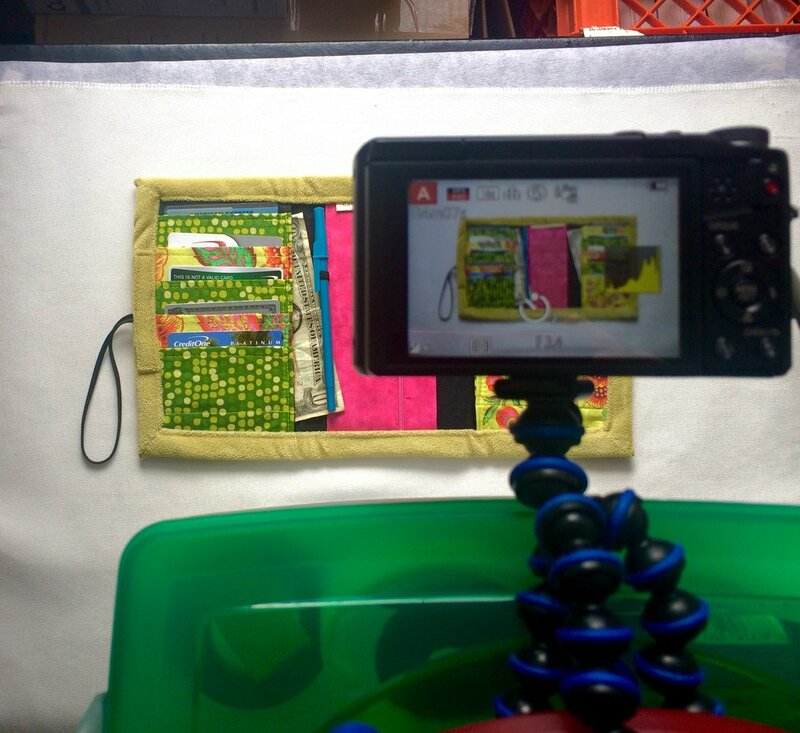 The photos below are a small, literal snap shot of where and how I take photos for my Etsy shop and my facebook page. 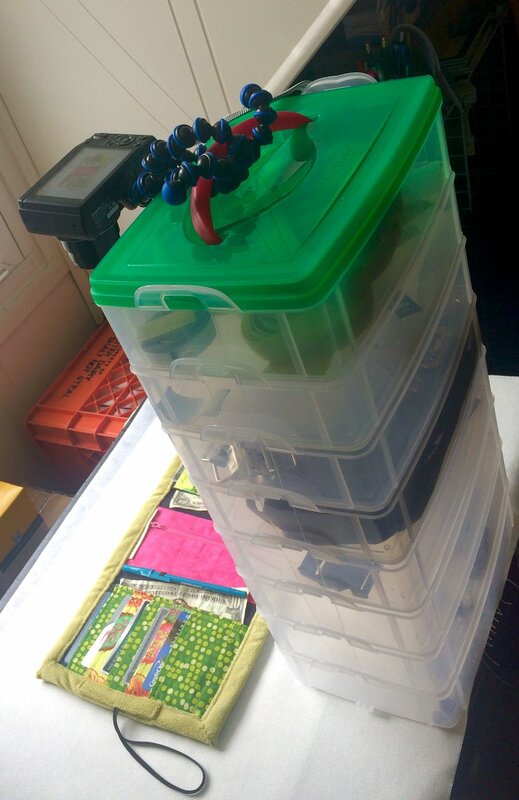 You have to get creative when you're not a photography expert, and sometimes you have to use stack-able storage containers from your craft shelves to stabilize your camera! I also have the best director of photography in the world, in my hubby/business partner. His experience as a production assistant has given him some excellent knowledge about how to position things, and how to get the best light, and so on. If it wasn't for him and his ideas, my photos would be total garbage. I'm not kidding! He is the photographer in this marriage, not me. Photography is not an area where I excel, at all. Stay tuned for my next post when I talk about the importance of sun protection, by way of Brush on Block! Dealing with incessantly oily skin is a drag. Your skin may show up shiny in photos, it may feel heavy or it may even feel like an oil slick! One of the most frustrating side effects of excessively oily skin, is acne. Acne issues aren’t limited to oily skin, as there are many different types of acne, some of which are completely unrelated to excessive oil production, but that is a discussion for another day off. While you may have oily skin year round, many people experience oily skin only in the hot summer months during which you may be more active, sweating more, and creating an increase in pore activity. If this is what you deal with, the Strawberry Spearmint Mask is for you. It is a wonderfully soothing mask that will pull out the impurities in your pores and create clearer, less oily skin. There are 5 active ingredients in this mask, all of which are extremely important and play a role in clearing out the overproduction of oil, and in this particular instance, all of them are the MVP’s of this mask. Strawberry Fruit Extract, Spearmint Extract, Kaolin Clay, Mushroom Extract, & Yogurt Extract are the active ingredients that I’ll focus on below. The main ingredient in the mask is Strawberry Fruit Extract. Strawberry Fruit Extract is astringent and tonic and helps tone, combat wrinkles, lighten freckles, and soothe sunburn. We all know about strawberries because let’s face it, some of the best desserts include strawberries. I’m talking the likes of Strawberry Shortcake, Macerated Strawberries, Strawberry Cheesecake, Strawberry Ice Cream (or sorbet! )… but this is not a post about dessert! This is about skin care, so let’s return to the original discussion. Strawberries offer skin some amazing benefits, so let’s jump right in. Strawberries contain Ellagic Acid which is an antioxidant that prevents collagen breakdown. Collagen breakdown is a major cause of wrinkle formation, so helping to prevent this breakdown will help keep your skin plump and wrinkle-free. The Ellagic acid also works to protect the skin from UV rays which can damage the skin. Ellagic acid reduces dark spots on skin, so this mask is helpful at lightening freckles and other discolored spots on the skin. Strawberries also contain alpha-hydroxy acid, which is an important substance that helps eliminate dead skin cells and cleanses the skin in the process. The acidic nature of Strawberries helps remove excess sebum on the skin, which is a major cause of oily skin. Decreases sebum production, creating less oily skin and helping to treat acne. Normalizing blood flow which in turn helps to reduce rosacea symptoms. Repairs cellular structure of the epidermis, which optimizes UV protection. Reduces sun spots or other types of uneven pigmentation by decreasing clusters of melanin granules. While mushrooms are usually reserved for eating (yum!) they also play an important role in skin health, and mushroom extract makes an appearance in the Strawberry Spearmint Mask. Mushroom extract improves skin tone and firmness, tightens pores to minimize the visible appearance of skin suffering from excess sebum secretion, and does not cause excessive dryness. Mushrooms contain a polysaccharide that is very beneficial for hydrating and plumping the skin. They also contain high levels of Vitamin D which has healing properties when applied to acne lesions, therefore, helping to treat acne. Kojic acid (naturally occurring in mushrooms) is a natural skin lightener, which inhibits melanin production on the surface of the skin and lightens the new skin cells that form after the dead ones are exfoliated. Another very important ingredient in the Strawberry Spearmint mask is Kaolin Clay. Now, you may be wondering what exactly Kaolin clay is, so here’s the story. Kaolin Clay is a naturally occurring clay mostly found in soils developed from the chemical weathering of rocks in hot, moist climates. When used in cosmetics it absorbs sebum and prevents pores from getting clogged. It is used to draw out impurities and toxins and thereby clears the skin of excess oil, pollution, and debris. Kaolin clay has a high silica content which helps to remove dead skin, allowing for quicker cell regeneration. One of the major components of the Strawberry Spearmint Mask that gives it its creamy and smooth consistency is yogurt extract. Yogurt moisturizes, smoothes, and stimulates cellular regeneration. Yogurt naturally contains lactic acid, which, when used on the skin, works as an exfoliant and removes dead skin cells. Lactic acid is also very beneficial in helping to rid the skin of acne, helps with dark circles under the eyes, and helps to even out uneven pigmentation of the skin. Also present in yogurt are probiotics, which fight skin infections, and high levels of zinc that help with acne. Is the heat this summer causing your skin to overproduce oil? Call or email me today to schedule your Strawberry Spearmint Mask facial and combat that oil! 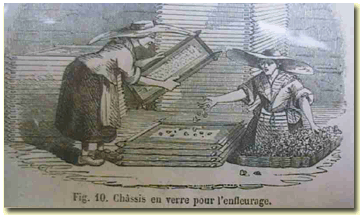 Chocolate - Not Just for Eating Anymore! If you’re looking for hydration, softening, and anti-aging for your skin, then look no further! The Dark Chocolate Mint Mask is your saving grace. This mask has amazing benefits and will leave your skin so unbelievably soft, you may even begin to think your skin is made of butter. I promise you, it is not! The Dark Chocolate Mint mask has 6 active ingredients, though the most important, Chocolate, is what I will be talking most about in this post. While the Dark Chocolate Mint Mask is used in any customized facial (depending on the client’s needs), it is the primary product used in the Chocolate Indulgence Facial. The rest of the facial is customized to each client’s individual needs. Cleanser, Enzyme, Serum(s) are all chosen based on each client’s needs. The Dark Chocolate Mint Mask is not used on pregnant or lactating clients or clients with rosacea. This mask is avoided on these clients because the mask itself can cause flushing which can last for a few hours. The flushing can aggravate rosacea, and for pregnant clients, it is essential to use products that are extremely gentle as skin changes are consistent throughout pregnancy, causing skin to be very unpredictable. For sensitive skin without rosacea, this mask can be mixed with a hydrating mask such as the Vanilla Bean Hydrating Mask, or the Goji Berry Yogurt Mask. Both of these masks are extremely hydrating and gentle and will help tone down the flushing caused by the Dark Chocolate Mint Mask. The Chocolate Indulgence Facial begins as all of my facials do, with skin analysis, double cleanse, exfoliation, and massage. The chocolate indulgence comes in when it’s time to close up the pores and round out the facial with the mask. The mask itself smells deliciously chocolately, and while you may find yourself wanting to lick your face, I urge you not too! It will be much more beneficial to let your skin reap the benefits rather than your digestive system. The Dark Chocolate Mint mask has 6 active ingredients, though the most important, it’s namesake – Dark Chocolate- is the focus. Protecting the body against many diseases due to its high levels of antioxidants which block harmful free radicals in the body. High levels of Vitamin C and Magnesium help to protect the skin. Omega 6 Fatty Acids help with healing wounds and scars quickly. Cocoa helps to increase and protect blood flow to the skin which keeps the skin healthy and glowing. Provides hydration to the skin which helps improve the skin’s complexion, due to it being an excellent emollient, lubricant, and humectant. Cocoa can help reduce stress hormones, which will help keep collagen from breaking down, keeping the skin plump and wrinkle-free. There are a variety of other excellent skin and health benefits of cocoa, but the ones listed above, are the most well known. The Dark Chocolate Mint Mask has 6 active ingredients (including Cocoa Fruit Powder) that all come together to create an amazing mask that will do amazing things for your skin. Theobroma Cacao (Cocoa) Fruit Powder is a very rich compound, with excellent emollient properties and is used with great effect on very dry, dehydrated and flaky skin. Squalene which is derived from olives, is moisturizing and enhances the skin’s natural barrier function. Tocopheryl Acetate (Vitamin E) is an anti-aging antioxidant that protects the skin from free radicals. Passionflower Extract contains flavonoids that are primarily responsible for properties that are skin calming. Honeysuckle Flower Extract is a natural preservative. To schedule your Chocolate Indulgence Facial, contact me at: carabdrescherlmt@gmail.com. I wanted to kick off my Esthetician’s Day Off series with what has become my favorite mask of the Skin Script line. The Marble Berry Nourishing Mask. Wait a minute, you’ve never heard of the Marble Berry? Not to worry, you’re not alone! Before I discovered this Mask, I had never heard of the Marble Berry either. But I promise you, it is a very real fruit, and it is very unique. The first of this summer’s seasonal specialty facials at Cara B. Design & Wellness is the Marble Berry Nourishing Facial. Obviously, from the title of the facial you can see that the Marble Berry Mask is the star of the show. However, this facial is customize-able (as they all are), by changing the enzyme used in the facial. The Marble Berry, scientifically known as pollia condensata, is a blue, iridescent berry that grows exclusively in Africa. The most magical aspect of this elusive fruit, is its color, which is the most intense color of any known biological substance. Yes, you read that correctly. This berry is quite unique. Possessing this intense color isn’t its only fascinating quality. While the Marble Berry is not edible, it does possess various health benefits for the skin. 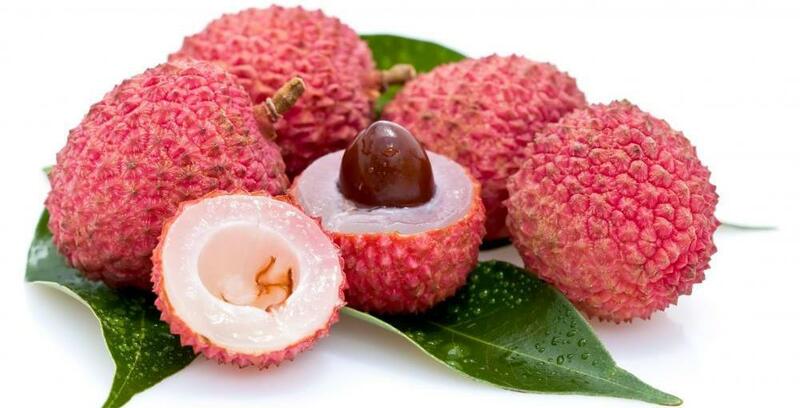 This fruit also contains polyphenol which provides antioxidant activity that is very effective at low use levels. What’s interesting about the Marble Berry, is that its beautiful, intense color isn’t due to pigment, however it’s due to something called structural color. What is structural color? It its simplest terms, it is the production of color by microscopically structured surfaces fine enough to interfere with visible light, sometimes in combination with pigments. This mask can be used on all skin types, including sensitive, rosacea, and pregnant women. While it can be used on all skin types, it does have the following benefits: anti-aging, softening, anti-inflammatory, improves barrier function, and reduces the appearance of fine lines and wrinkles. The main ingredient in this mask is the Marble Berry, however, it has a few other very important and effective ingredients. With this mask on, I look like Violet Beauregard from Willy Wonka! 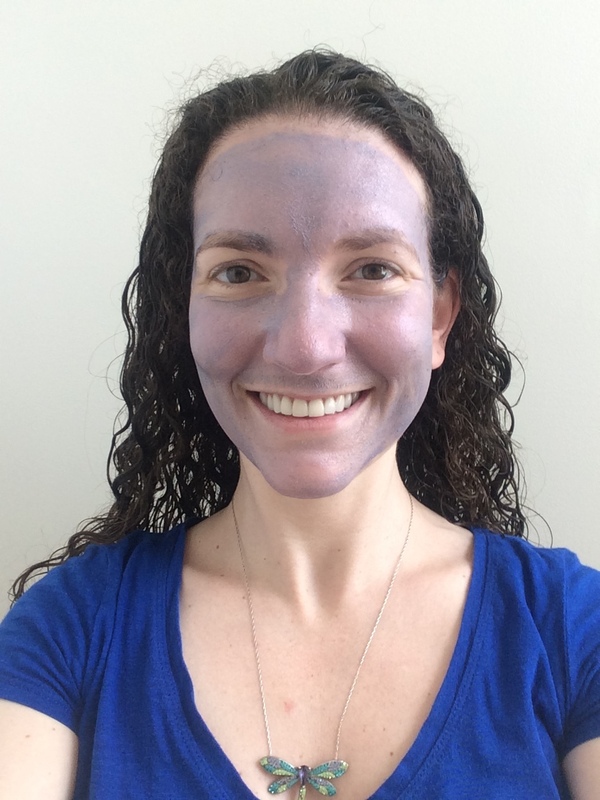 "You're turning Violet, Violet!" 1. Thiotaine®, made using Ergothioneine (L) which is a natural antioxidant and amino acid that can aid the skin’s natural ability to prevent damage caused by UV radiation. It does this partially by recycling vitamin C, and also ensures efficient energy production. Inhibits tyrosinase. 2. Squalene, derived from olives, moisturizing, enhances skin’s natural barrier function, protective, and boosts skin’s ability to retain moisture. 3. Cyanidin-3-Glucoside is a purified extract from the heart of Black Rice Bran. This particular extract is high in antioxidant content, and also acts similar to an anti-inflammatory, which helps to keep skin soothed and clear. 4. Phenyl t-Butylnitrone, a Spin Trap. It is a highly active oxygen and nitrogen complex. It is considered an “intelligent” antioxidant because instead of destroying free radicals, it traps them, transforms them into useful oxygen, and then transports them back into the respiratory cycle. This activity keeps the skin continually spinning the effects of aging away from your skin; helping to maintain hydration so that skin appears healthy, clear and more fortified. During the Marble Berry Nourishing facial, skin is cleansed, exfoliated, treated, and toned. 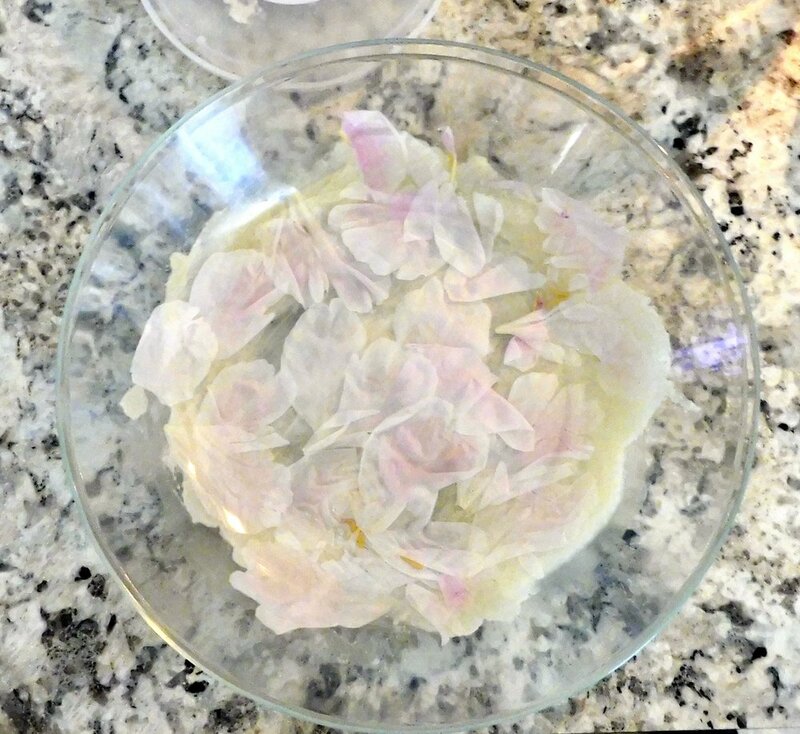 To close out the facial, the Marble Berry Mask is applied to the skin for about 10 minutes. This particular mask is tremendously nourishing and leaves skin feeling as soft as butter! Schedule your Marble Berry Nourishing facial today by emailing carabdrescherlmt@gmail.com or calling 215-601-0840.